Having been born on a Sunday, she was given the middle name Domingas, which became 'Mingas' for short. She was also named Elisa, after a legendary paternal grandmother, and the patronymic Salatiel as per traditional custom. She was born, and grew up, on the southeastern coast of Africa, in Lourenço Marques, the capital of Portuguese East Africa, as it was known at the time. Just a few years later, 'LM' would become Maputo and 'PEA' would become independent Mozambique. Mingas was the fourth in a close-knit family of six children. From early on she developed a love of music and, in particular, of singing. She started singing in church and from the age of 15 was part of a church youth choir. At about that age, she also participated in some music shows in Maputo, that were aimed at identifying young talents. Shortly after one of these talent shows, at the age of 17, she was offered the opportunity to sing on a regular basis in the Maputo nightclub 'Sheik'. Her parents were, at least initially, less than enthusiastic about this, but her oldest brother, Max, was supportive. He managed to win the rest of the family over by committing to look after Mingas, to drive her to and from the nightclub and to stay during her performances. Mingas initially performed for about half an hour each weekend night with a repertoire consisting of songs made popular by Miriam Makeba, Roberta Flack, Diana Ross and others. This schedule was soon increased to include some weekday nights and eventually to five or six nights a week. And that is how Mingas' professional singing career got started! Over the next 2-3 years in the late 1970s, while Mozambique was going through its birth pains as a new, independent country, Mingas continued singing in Maputo nightclubs, first at 'Sheik' and later also at the clubs 'Buzio' and 'Zambi'. 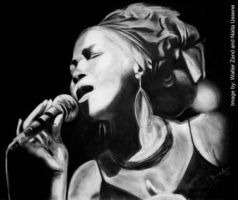 She was performing with some of the most popular and successful bands in Mozambique at the time, such as 'Hokolókwe', 'Africa Power' and João Domingos' band. Inevitably, Mingas' life and career became intimately intertwined with the fortunes and misfortunes of her country, Mozambique. She was a toddler when the armed struggle for independence first started in Mozambique and in her mid-teens when Mozambique gained independence from Portugal in 1975. After independence followed a brief period of relative euphoria in the country, before some very harsh realities started to set in. A failed coup-attempt shortly after independence led to some invasive domestic policies, designed to identify and neutralize potential 'traitors'. Hostilities from neighboring countries, pre-independence Rhodesia and Apartheid South Africa, fed an increasingly destructive civil war in Mozambique. As a result, living conditions deteriorated and people had to struggle with severe shortages of many of life's necessities. Many professionals, and others who had the means and connections to do so, left the country, thereby leaving schools, hospitals and businesses without trained staff. Pursuing a career as a singer, musician or other entertainer in this environment and under these conditions, was sometimes frowned upon as being frivolous, - or worse. Mingas and those of her colleagues who 'toughed it out' and were determined to stay despite the hardships (see context box), obviously had to possess a strong conviction that conditions would eventually stabilize and their beloved music would again play the important role in Mozambican culture that it always had in the past. In the meantime, though, they had to face the reality that, by the end of the 70s, there were essentially no live music venues operating in the country. Club owners and many of their patrons had by then simply left the country. After the last nightclubs in Maputo had closed their doors, Mingas joined up as the lead singer of the band 'Hokolókwe' and, with their music, they toured the country, to the extent possible under the civil war conditions. The early years of the 1980s were difficult for the vast majority of people in Mozambique. This was when the civil war, as well as cross-border incursions and bombings by Rhodesia and South Africa, were at their worst. In addition, widespread multi-year droughts and crop failures magnified the hardship for large numbers of people in the region. Absent any other recording industry, and being the only broadcaster in the country at the time, 'Radio Mozambique' (RM) played an important role in making Mozambican music heard around the country. RM took the initiative to create and support an orchestra for popular Mozambican music, that became known as 'Grupo RM'. 'Orchestra Marrabenta Star de Mozambique' was created out of Grupo RM in 1987, for the primary purpose of making Mozambican music and culture better known and appreciated outside the country. The lead, female singers in the group were Mingas and Dulce. The group, which included a strong brass section with trumpets and saxophone and also a group of dancers, choreographed a program that was presented with considerable success on a tour in Europe in 1987. Mingas' solo performances during the tour included the song 'Ava Sata Va Lomu' and the Marrabenta song 'Elisa Gomara Saya'. She also participated in the group as a dancer and as backing vocal. 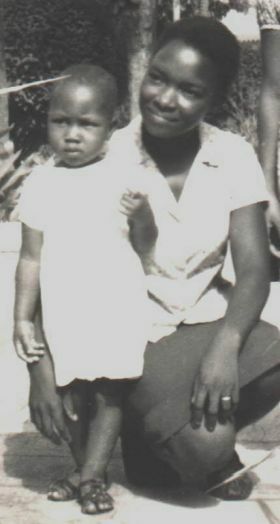 In March of 1988, Mingas performed with Orchestra Marrabenta at the concert for the 'Child Survival and Development Symposium' in Harare, Zimbabwe. Internationally celebrated artists that also performed at this concert included Miriam Makeba, Harry Belafonte, Hugh Masekela, Paul Simon and Mano Dibango. In Zimbabwe, Mingas also performed with Orchestra Marrabenta in Bulawayo and in Maswinga. 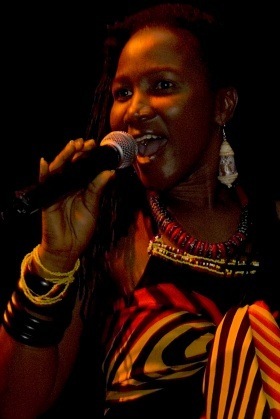 While in Zimbabwe, the group recorded material for two CDs, including Mingas' solo performances of 'Ava Sata Va Lomu' and 'Elisa Gomara Saya'. The first of the CDs, 'Independance', was released in 1989 under the Piranha label (Piranha-EFA 018622), while the second, 'Piquenique' (Piranha-EFA 01907-2), was not released until 1996. Orchestra Marrabenta continued their highly successful, international tours in 1988. In 1987 they had visited France, Germany and Holland, and in 1988 they toured Sweden, Norway, Denmark, England, France, Germany, Portugal and the Cape Verde Islands. In October 1989, Mingas was invited to perform at a concert in Brazil, in connection with a conference of journalists from Portuguese-speaking countries. She represented Mozambique for this concert. Brazil was represented by Gilberto Gil and Hermeto Paschoal, Cabo Verde by Zeca Di Nha Reinalda and Angola by the band 'Ilundu'. In 1989 Mingas recorded the song 'Aliranzo', a composition by Chico Antonio, and her own song 'Nweti' at Radio Mozambique for broadcasting. This decade started out in a very promising way for Mingas. Together with Chico Antonio and the group 'Amoya' (which essentially was the RM Band under a different name), she was awarded the Radio France International Grand Prix du Concours "Les Decouvertes 90" for the song 'Baila Maria'. The award was presented at a gala show in Guiné Conakry in 1990. In connection with this award, Mingas, Chico Antonio and the group performed at the jazz club 'New Morning' in Paris. The CD 'Cineta' by the group Amoya, which includes the track 'Baila Maria' with Mingas and Chico Antonio as lead vocals, was then recorded at Mercadet Studios in Paris in 1992 and released in November the same year by RFI and Forlane. By now, Mingas' recordings were getting significant airtime on the national broadcaster, Radio Mozambique. In addition to the Orchestra Marrabenta and Amoya CD tracks that had been released in Germany and France, respectively, RM had recorded a number of her songs at their studio in Maputo for broadcasting in Mozambique. With her frequent appearances on radio and TV, in the form of live concerts and interviews, she also became well known to a nationwide audience in her country. After her initial success with the song 'Nweti', Mingas started to put more emphasis on composing her own songs. She writes her songs in the Xitswa language, her mother tongue, which is spoken in the province of Inhambane in Mozambique, where her parents and grandparents grew up. The songs are not political in the traditional sense of the word but, rather, just reflective of realities of life for ordinary people, or 'extraordinary people', as they may be. In 1993, Mingas was again successful in the annual Radio Mozambique music competition when she was given the award 'Best Female Singer of 1993' for her performance of her song 'Nwananga'. In the early 1990s, Mingas provided the vocals for the background music in a documentary video on the war in Moçambique, entitled 'A Guerra de Todos Nós', which was produced by Sol de Carvalho and Albie Sachs. An English version of the video, entitled 'The Deeper Image', was also produced. 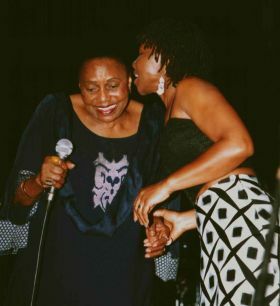 During a holiday in Maputo in December of 1994, Miriam Makeba had the opportunity to hear Mingas' music. She liked what she heard and invited Mingas to her home in Johannesburg to prepare as backing vocal for an upcoming tour of Europe and Australia. For Mingas, who had always been a great admirer of Miriam Makeba, this was a dream come true. 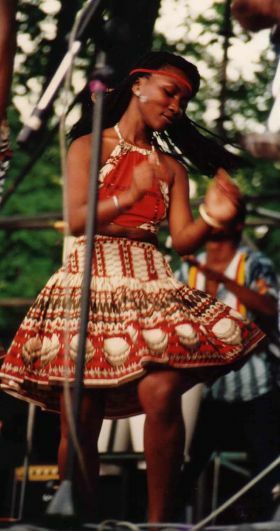 For the next four years, 1995-1998, Mingas was part of Miriam Makeba's concert tours in Europe, North America, South America, Africa and Australia. She participated in the concerts as a backing singer and also, at each concert, gave solo performances of her own songs. In Europe, the concert tours took her to Italy, France, Germany, Holland, Switzerland, Belgium, Austria, Sweden, Denmark and Norway. Some of these countries, notably Italy and Germany, were toured several times. In Australia (1995), she had the opportunity to sing in the famed Sidney Opera House. Also included in the Australian tour were Brisbane, Melbourne and Perth. In Rio de Janeiro, Brazil, she participated in Miriam Makeba's concert for Pope John Paul II in 1997. Also in 1997, a tour of western USA and Canada took them to several venues in the states of California, Washington and Oregon and to Victoria and Vancouver in Canada. Tours in Africa with Miriam Makeba included Tunisia, the Ivory Coast, Namibia, South Africa, Swaziland and Mozambique. Her friendship and working relationship during these years with Miriam Makeba, arguably the greatest singer ever from Africa, became an invaluable experience for Mingas that she will treasure for ever. In 2001, Mingas participated with solo performances in the 'Miriam Makeba Tribute to Dolly Ratebe', which took place at the Mandela Theater (previously known as the Civic Theater) in Johannesburg. Later the same year, she was invited by PJ Powers to perform for Nelson Mandela and Graça Machel at the launch of 'The Mandela Centre of Reconciliation' at the game reserve 'Shambala' in South Africa. 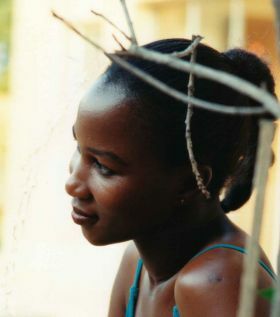 When the NGO 'Médecins Sans Frontières', as part of their HIV/AIDS awareness campaigns, produced a music CD in 2002 with contributions from Mozambican artists, Mingas participated with her song 'Xini Xiku Kluphaku'. The title of the CD was 'Vidas Positivas'. 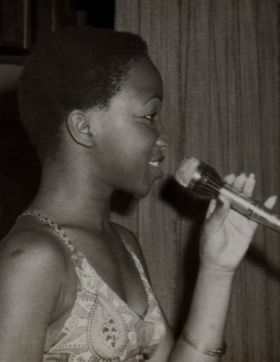 For the 25th anniversary celebration of the Mozambican Parliament in 2002, Mingas was invited to perform her solo, a cappella rendition of the new National Anthem in the House of Parliament. Together with Miriam Makeba, she performed at the gala dinner opening of the Summit of African Heads of State held in Maputo in 2003. In South Africa, the 10th anniversary of the first democratic elections was celebrated during the entire year of 2004. A grand closing ceremony was then held at the Athlone Stadium in Cape Town on February 11, 2005. It was an all-day and all-evening affair, which was broadcast live on South African TV, and which included many well-known South African artists. On the initiative of the South African High Commissioner in Mozambique, Mingas was invited to perform as one of only two non-South African artists at this '10 Years of Freedom Closing Celebration'. The Mozambican TV station STV introduced the show format 'Fama Show' to the Mozambican public in 2005. This show, which is the Portuguese equivalent of the 'Idol' shows in many other countries, became an instant, huge hit in Mozambique. Mingas became part of the excitement as one of the three judges on the show during the first season showings. In 2005, Mingas also recorded and released her first solo CD, 'Vuka Africa'. The initial batch produced of the CD was quickly sold out in Mozambique. Demand for the album remained high, but due to the particular difficulties still lingering in her country, it took until early 2009 before a new edition of the CD could be made available under new cover and by a new distributor. In late 2005 and early 2006, Mingas again worked with Sol de Carvalho on one of his film projects. Mingas provided original music and vocals for the soundtrack of the feature film 'O Jardim do Outro Homem', directed by Sol de Carvalho. The film was co-produced by Promarte, Fado Films and Les Filmes de May. When the highly acclaimed Fado singer, Mariza, visited Mozambique in June, 2006, Mingas preceded her on the stage with an opening performance at the UEM Cultural Center in Maputo. 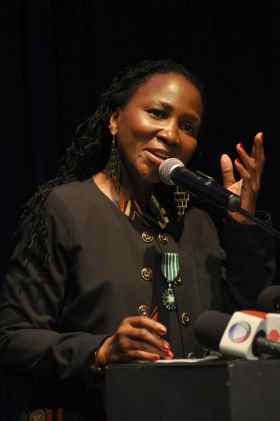 In the annual Radio Mozambique Music Awards, 'Ngoma Moçambique', Mingas won the 'Song of the Year' award in 2006 for her song 'Klonipho'. As part of the 'Mozambican Arts and Culture Week', organized by the Mozambican Embassy in Portugal, Mingas performed at Casino Estoril and Praça Monsanto in Lisbon in June of 2007. In August the same year, she was invited to perform at the 'Newtown Women in Arts Festival' at Bassline in Johannesburg, South Africa, where she shared the stage with the South African singers Thandiswa and Lira. Also in 2007, Mingas performed at a gala dinner for President Hu Jintao of China during his visit to Mozambique, at the Ponta Vermelha presidential palace in Maputo. On November 23, 2007, Mingas celebrated 30 years as a professional singer by giving a very successful, sold-out concert at the Centro Cultural Franco-Moçambicano in Maputo. The concert was recorded live for a forthcoming CD and DVD. The musical direction of the show was provided by Jimmy Dludlu and it was produced by Sonarte. In 2008, Mingas worked with Hugh Masekela on his CD "Phola". On one of the tracks of the CD, Mingas and Hugh are performing together in one of Mingas' compositions, 'Malungelo'. In February, Mingas performed together with Yvonne Chaka Chaka at the 'South African Women's Day' celebration, organized by the South African High Commission in Maputo. In February, she also recorded a video spot for UNICEF in support of children's rights. The annual MozJazz Festival took place in April at the 'Parque dos Continuadores' in Maputo. Mingas performed on the second day of the festival before a great, appreciative crowd. In June she was off to Germany, where she performed in Berlin and Munich, and later in Prague in the Czech Republic. Before and after this European trip, she toured the provinces of southern and central Mozambique and also went to Harare in Zimbabwe, where she performed together with the Zimbabwean singer Dudu Manhenga. She ended this first stage of her Mozambican tour with a much appreciated, sold out concert at CCFM in Maputo on July 31. Her collaboration with Dudu then continued with performances at the 'Arts Alive' Festival at Bassline in Johannesburg in September, and at Centro Cultural Franco-Mozambicano in Maputo on October 2, 2009. In early 2009, Mingas was recognized with a sponsorship agreement from the mobile phone service provider MCel of Mozambique. This, she hopes, will help her free up some more time for song writing and recordings. During 2009 she has started to work on material for a new CD, that she intends to record in 2010. For the national elections in October of 2009, Mingas participated, together with Stewart Sukuma, in a nonpartisan effort to encourage the people of Mozambique to vote. This effort, organized by the national election commission, resulted in a music video for broadcasting on the various TV stations in the country, as well as sound tracks for radio broadcasts. And in her native Mozambique, at this somewhat more mature stage of her career, Mingas is more popular, loved and respected than ever!